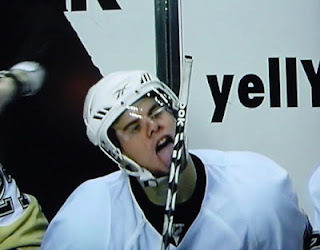 I have written a lot about Tyler Kennedy for this website, on Twitter, and on Facebook. I have been a long-time defender of TK and sometimes have felt like I was the only one out there. Well that's not exactly true, because during the Pens regular season the only bigger TK fan than me was the one who mattered: Dan Bylsma. Despite a regular season where he struggled mightily at times, and despite the fact that fans and talking heads alike were calling for Bylsma to scratch Kennedy, TK played in 46 of the Pens 48 games, and the only two he missed were due to illness. Bylsma used TK everywhere: on the 2nd line with Malkin and Neal, on the 3rd line with Cooke and Sutter, on the 4th line, hell even on the first line as a center when Crosby's jaw was broken. Bylsma's decision to stick by Kennedy in the regular season, despite his struggles - just 6 goals, 5 assists and a 6% shooting percentage - certainly led me to believe that TK would continue to play in the playoffs. That assumption was not only based on Bylsma's sticking with Kennedy in the regular season but also based on TK's past performance in the playoffs. That assumption proved to be wrong - and TK was a healthy scratch for the first 4 games of the Islanders series. Needing a spark and some speed to match the speed of the Islanders, Bylsma inserted TK in the lineup and Kennedy shined - scoring a goal in his first game back and helping the Pens right the ship. Despite a goal and an assist in the last 2 Islanders games, and despite a goal and two assists in the Senators series, TK was AGAIN a healthy scratch for the beginning of the Bruins series. TK was, however, re-inserted into the lineup for the last 2 games of the series. So what's next for Tyler Kennedy? TK is a restricted free agent (RFA). As an RFA the Pens can keep Kennedy by tendering a qualifying offer equal to his salary this past year, which means Shero and company would need to make Kennedy an offer of at least $2 million per year. I think this is highly unlikely and that's good news for TK and bad news for me. Kennedy is a proven goal scorer and a proven contributor in the playoffs who quite frankly deserves a better opportunity than he is likely going to get here in Pittsburgh. The Pens salary cap issues are well-documented and it is hard to imagine Shero green-lighting $2 million a year to a guy who was a healthy scratch in the playoffs for almost as many games as he wasn't. I don't want TK to leave, but I firmly believe that it's in his best interest. Is TK a 40-goal scorer? No. But TK is a previous 20-goal scorer who could contribute on any number of teams. He isn't afraid to shoot from anywhere on the ice and brings energy, speed and enthusiasm to the ice. Kennedy is never again going to get the chance to be a top 6 forward for the Pens, but he could be a top 6 forward for another team. A team like the Jets, who are desperately in need of a winger who could score, is just one example of a perfect landing spot for Kennedy. Not only would TK get an expanded chance to play somewhere else, he would also likely get a raise. Do I think there is zero chance that Kennedy will be back in Pittsburgh? No, I don't think there is zero chance, but I think the chances are slim. The best scenario to be painted under which TK remains a Pen is a new head coach that really wants to keep TK - but of all of the decisions that a new coach may want to weigh in on, if we get a new coach, the decision to tender or not to tender a qualifying offer to Kennedy seems pretty low on the list. I hope I am wrong and that TK is a Pen next year, if not, I promise to buy a 48 jersey for whatever team TK ends up lacing them up for - well, any team except the Flyers.